With the calendar flipping over to February, it’ll be Valentines Day before we know it – and that means romance is in the air. If your heart is set on a lovers’ getaway, how about snuggling up in sparkling Antarctica, or sipping cocktails in the Seychelles? 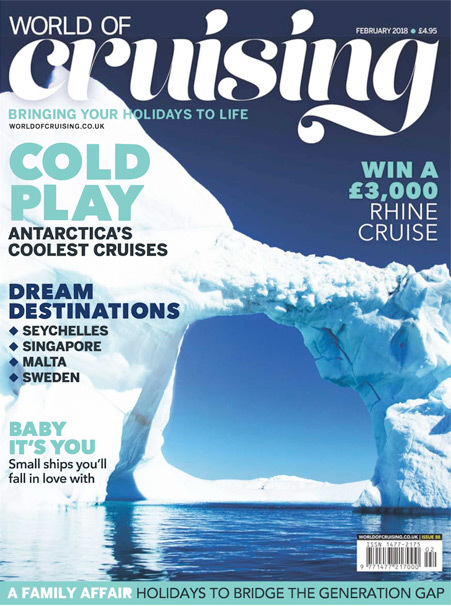 Or why not slow the pace with a dreamy canal cruise in Sweden or Scotland? Whatever your heart desires, we have it covered. And if your next holiday will be a family affair, we’ve found some fabulous cruises that take every generation’s needs on board – from 18 months to 80 plus. For foodies we report on the six-star line that’s raising the bar with its all-speciality dining options, while for history buffs we try out a top tour to the Normandy beaches. But wherever and whenever you set sail all of us a World of Cruising would like to wish you bon voyage!